We are not determined to stop the multiculturalist crusade against Western civilization. We are not ready to defend our values, our culture, our religion, our life-styles. We are not ready to sacrifice our relatively comfortable life. Many thanks for your invitation. After participating in the Valdai Discussion Club in St. Petersburg in June earlier this year, this is my second opportunity to attend one of your gatherings. I have never been not only to Sochi, but – I have to confess to this audience – south of Moscow. I am glad to be here. I always try to respect the title of the conference or the session. This time I have a problem. The title “Together against Threats: Overcoming Strife for the Sake of General Progress” seems to me rather problematic. Like many of you, I feel a great threat to our future, our freedom, democracy, peace, security and prosperity in the current era, but I have a problem accepting your tenn '·general progress'·. Is it really necessary and/or helpful to use this old, so much misused , to another era belonging term. Isn't this term a mere relic from the past? I suppose we don't want to return to the old communist days with their "'quasi-progressivistic" ideology. To make it clear, I don't protest against speaking about threats, because I am frightened and scared by the ongoing loss of freedom and democracy. And peace. Speaking about “progress” is, However, misleading. The British conservative thinker Edmund Burke said, ironically, already in 1770: “the world advances progressively backward”. After a quarter of a millennium, I am inclined to agree with him. Immediately after the fall of communism, we were fascinated by the end of oppression and totalitarian practices and had the feeling we entered a very promising era. With the benefit of hindsight, we see now that it was a short-sighted interpretation of events. Surprisingly and paradoxically, our current problems started at that moment. The fall of communism released processes, ambitions and erroneous concepts which gradually, step by step led to the current state of affairs. It was generally assumed that it was sufficient to get rid of the political, economic and social system of communism, which was a task in which some of the post-communist countries succeeded. I would dare claiming that my country was one of them. It was at that time, however, not sufficiently understood that it was not enough. While building a new system, it would have been necessary to avoid bringing with us the old misconceptions, apriorisms and fallacies, as well as vested interests, and to avoid creating new ones. Not just in the East. This is what I would like to say very clearly. Current problems stem more from the West now than from the East (especially not from the old East). My strong views about it reflect my looking at the world from Prague, from Europe. That's why I speak about our problems and about us because Europe is a place where the failure of the current developments is more profound than in other parts of the world. To be correctly understood. I don't compare the relative size of catastrophic developments and of human suffering, but the relative degree of failure. From that perspective, the greatest threat to our peace, freedom and democracy is not the Islamic State, Al-Kaida or the barbarous assassins of “all stripes” in many parts of the world. It is not the EU, Washington or Moscow bureaucrats with their never-ending attempts to mastermind and control our lives. It is even not the alarmist and populist media with their attempts of mediocracy. Nor is it the autocratic big “global” bankers, businessmen and participants at the Davos World Economic Forum. Nor the remaining dictators. To say that is not a hitherto unknown statement but it may sound surprising to some people. The problem for those who feel – like me – personally and existentially threatened by the current developments is that we are, together with our fellow citizens, weak, opportunistic and indecisive. That our inactivity suggests our loss of vitality, our lack of self-confidence and our growing fatigue. That we are without courage and without a clear positive vision of the future. That we are forgetting common sense and our common purpose. That we are showing our apparent incapacity to learn lessons from the past and to appreciate the meaning and role of history. That we passively live with disillusionment over the state of the world. That we are victims of failed isms or humanrightism, of multiculturalism, of environmental ism of homosexualism, of cosmopolitism and transnationalism. That we have again become victims of – and at the same time contributors to – the fallacy of political correctness. That many of us consciously or subconsciously believe in the omnipotence of human mind and its ability to rationally mastermind human society. A new class of relatively affluent pleasure-seekers in the Western world, which means us, is undermining the very institutions that made our free and prosperous world possible. We don 't see it. We are not determined to stop the multiculturalist crusade against Western civilization. We are not ready to defend our values, our culture, our religion, our life-styles. We are not ready to sacrifice our relatively comfortable life and start fighting for freedom and democracy. We do not courageously contest the continental-wide and planetary thinking and protect the nation-state as the only reliable guarantor and guardian of democracy. We say- with only a very weak voice – that the sovereign nation-state is not a historical anachronism. I mentioned my Central European roots and my Central European angle of vision. I don't pretend knowing your country sufficiently well but let me say that I don't think that Russia is immune from the same dangers. These dangers shouldn't be politically trivialized. I'am no dreamer of empty dreams.I am optimistically convinced that we can and have to – for ourselves and for all who see it similarly search for a rational and feasible program (or vision) which could give us guidance how to behave. We should start at home, with ourselves, with practical and realizable moves. We shouldn't seek global solutions and give advice to other people. We should support the opening-up of countries, free trade, free exchange of peoples and ideas, growing internalization of human activities, but we should oppose transnationalism and global governance. I don't agree with Fukuyama and his assumption that globalization with bring about the homogenization of all human societies. I find more agreement with Huntington when he says that globalization will generate conflicts. We have become witnesses of these conflicts now. We live in a divided world again. There was a chance – or at least a hope – to overcome this division at the beginning of the 1990s but there existed an unfavourable asymmetry – the East was weak and had to concentrate on its long overdue "homework" to build a normal society, the West was – to a greater extent than was desirable and justified – convinced of its perfection and superiority and was not ready to deal with us. I tried to argue all the time that we were able to be meaningful partners because we didn't feel defeated – who was defeated was our communist regime. not us. We were,however, not listened to. As a result, we are in a fractured world with too many dangerous battlegrounds. There is no reason to superficially talk about them now. We should talk about us. Are we prepared to do anything and do we really want to? I am afraid not. We are not ready to get rid of our still comfortable life and of our prejudices. We don't have strong views. We are witnesses of the increasing public apathy, of the undergoing trivialization and denigration or education. not to speak about the massive presence of ideologic indoctrination which reminds me of the communist era. We replace education with indoctrination in political correctness. It leads to the loss of elementary understanding of the functioning of human society and to the loss of our ability to see the whole. The partiality and fra6rmentation of our thinking makes the life of modern manipulators of our societies relatively easy. The contemporary journalism has become another menace to our ability to grasp the world around us and is leading to a gradual evaporation of the authority of the media. The internet enabled the rise of an amateur class of pseudo-journalists who trivialize debate. We have to talk openly and sincerely about these issues. 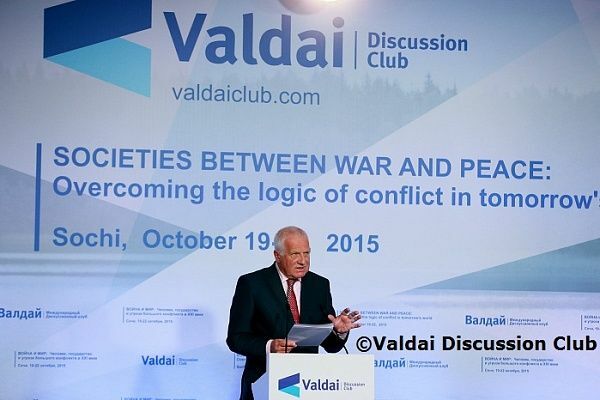 I wish the Valdai Club Discussions to become a productive setting for understanding. discussing and opposing all these tendencies. Thank you once again for bringing me here.